Earlier this week Search Engine Land reported that Christian Oestlien, the Ads Lead for Google+, had posted a message asking businesses to hold off on using personal accounts to create business pages and that non-user profiles would be shut down. Quite a few media outlets have already created personal Google+ accounts and many of them are still up and running. With business profiles potentially not available to everyone until later this year will news sites keep using personal accounts, and will Google let them? In checking today several high-profile news sites still have active pages including Mashable, the Chicago Sun-Times, Breaking News, The Next Web and Search Engine Land. [UPDATE: Most of the pages referenced above have now been taken down so I removed the links; see below]. Others that had been previously reported as active now result in a 404 page including CNET, ABC News Radio and ITV News. According to Dan Patterson ABC News Radio took its page down after learning that Google did not want businesses to create personal accounts. Other media outlets have similarly followed suit. As for Mashable, in a Google+ discussion (that is no longer available so the link has been removed) started by Brent Csutoras, Sean Carlos noted that the Mashable News page had stopped appearing in search results for Google+ pages with “news” in the title but then later reappeared. Some saw this as a sign that the page had been banned or taken down and then allowed to reappear, potentially indicating a double standard for some brands. It will be interesting to see how long news and content sites will continue to use personal accounts and whether or not Google enforces stricter compliance. The best solution is for Google to fast track the Google+ business pages, which they now appear to be doing at least in terms of working with an initial test group. With various media sites already reporting good referral traffic from Google+ it is hard to blame any news organization for wanting to establish a presence ASAP. For news sites that have not yet created a personal account I’d heed Google’s request and wait for the business pages. In the interim there are plenty of ways for individuals within an organization to engage users and promote content from their own accounts. In addition, businesses can apply to be part of the initial test group for Google+ business profiles. But hurry; yesterday Oestlien told AdAge that they have already received thousands of applications and they’d likely stop taking more early next week. In the 7-10 days after I published this post a lot more brands (in news and other categories) created a Google+ presence using personal accounts. Many of the pages were getting a lot of activity and engagement, creating the impression that experimenting with personal pages might be worth it after all. But then this week Google started suspending many of those profiles. In fact all but one of the pages I linked to above have now been taken down. 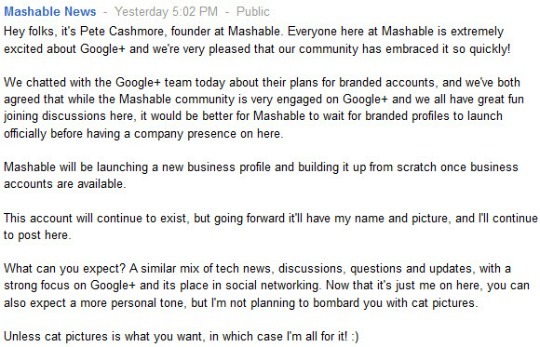 See Google Removes Mashable, Sesame Street & Other Prominent Accounts From Google Plus for more information. The good news is all this activity, as well as the flood of applications that Google apparently received for the business page test program, has prompted Google to accelerate its timetable for business pages. Yesterday Google+’s Christian Oestlien published a new post indicating that business pages would be available to everyone within the next few months. I cant see many business putting any time or effort into Google+, in the UK it hasn’t really taken off at all on a personal level never mind businesses trying to sign on. I know I wont take the time to put a business account on, again that if I will be able to. Adam, I could see some businesses being slow to adopt but specifically for news organizations and other media sites there is a natural fit for content promotion and user engagement. So I’d expect many news and content sites will try to make good use of Google+ as soon possible. You would think Google would have used a bit of foresight and launched the Business Profiles right from the beginning. they only had to look at how many business currently utilise Facebook to know that businesses would be all over Google+ as soon as it launched. I agree, Steven. It’s surprising that they’d roll it out to individuals but not to businesses, even in testing. Obviously social media is a huge part of online marketing, and businesses will carefully pay attention to anything that Google does, since a search presence it’s so crucial. I’m surprised they didn’t start with a business option right out of the gate in the field test too. Since I wrote this post a lot more news media sites have sprung up on personal pages. But it looks like this week Google started suspending a lot of those brand pages. Of the ones I linked to in my post only one is still active now.